Wheelchair casters are a common point of failure in adverse environments due to rough terrains, inclement and debris. Failures can lead to wheelchair user injuries and are often difficult to repair or replace. The World Health Organization has indicated that ISO 7176 may not be sufficient to confirm the reliability of wheelchairs used in adverse environments, and that has been echoed at consensus conferences and by a working group of wheelchair product experts. These experts have furthermore ranked caster failure as one of the most critical areas for testing and test development. 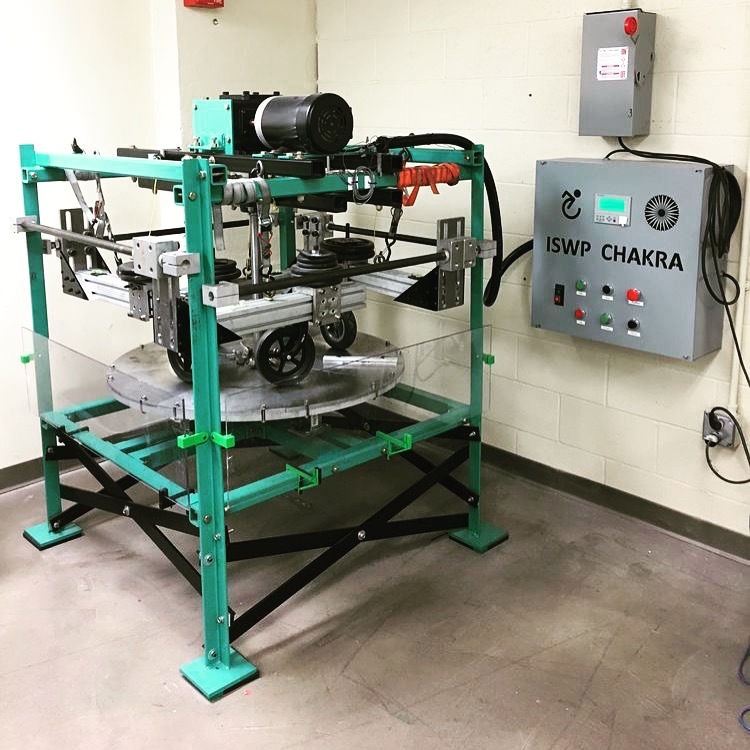 The ISWP Caster Test, also called as the “Chakra”, has been developed to address the testing requirements for casters used in adverse environments. It consists of a turntable on which test casters are suspended from arms which are clamped to the test equipment (see figure below). The Chakra is able to test casters against straight and angular impacts as seen in the field. Corrosion seen in humid environments and wear experienced on rough surfaces are integrated into the caster testing protocol. The exposures of testing factors included in the protocol are based on outdoor exposures seen in adverse environments. Step 1. Casters are tested for an interval of 100 hours in the corrosion chamber as per standardized corrosion testing methods. Step 2: Casters are tested against bumps and abrasive surfaces based on the caster wheel size. Caster direction of rolling is reversed following a certain number of test cycles. Casters are tested until there is a physical failure, deformation, tire wear or loss of functionality. If the samples complete the two cycles of testing, the manufacturer can choose to test the product further.